She captioned the photo as "money shot"
Be ready to get on board the Chennai Express! Deepika Padukone and Shah Rukh Khan just recently featured in a priceless selfie on Sonakshi Sinha's Instagram from last night's Filmfare Glamour and Style Awards. 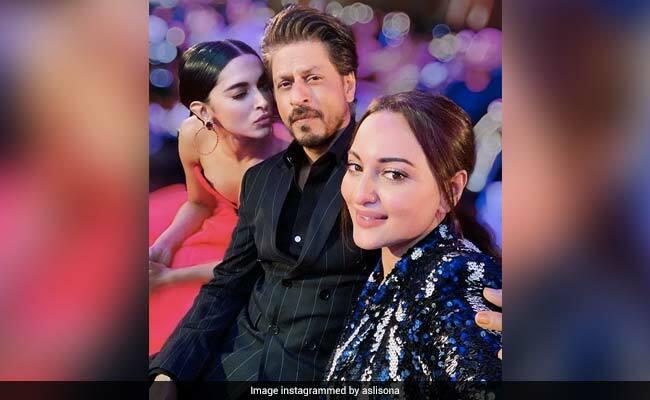 The Rowdy Rathore actress roped in the Om Shanti Om co-stars for a selfie and added just the perfect caption to it: "Money shot," she wrote. At the awards, Deepika Padukone turned heads in an off shoulder Jean Louis Sabaji asymmetric gown while Sonakshi Sinha experimented with her look in a sequinned pant-suit designed by Dhruv Kapoor. Shah Rukh, who is almost always fashionably late at events and parties, was suave in a striped suit. Just like us, Sonakshi's Instafam is also way too happy to see Deepika and Shah Rukh together in a selfie with comments like "all my favourites" and "gorgeous people" raining down on her feed. Deepika Padukone made her Bollywood debut with Shah Rukh Khan with 2007's Om Shanti Om and then also starred in films such as 2013's Chennai Express and 2014's Happy New Year. Deepika also featured in a special cameo in Shah Rukh Khan's last release Zero. Deepika Padukone won the Most Glamorous Star (Female) while Shah Rukh Khan took home the title of the Most Glamorous Star (Male). Sonakshi Sinha turned out to be the winner of the Risk-Taker of The Year! Meanwhile, we spotted another moment from inside Filmfare Glamour and Style Awards on Preity Zinta's Instagram. Sonakshi Sinha, Preity Zinta, Kajol and Karisma Kapoor formed a "smiling rainbow" and we must say it's one of the prettiest rainbows we've seen. The Filmfare Glamour and Style Awards saw Bollywood stars walk the red carpet in their fashionable best. Sonam Kapoor was a diva in a saree worn with a cape while Janhvi Kapoor, Shilpa Shetty, Sunny Leone, Bipasha Basu, Vidya Balan, Saiyami Kher and others also upped the fashion ante for the night. The men's section was well represented by Shahid Kapoor, Ishaan Khatter, Kartik Aaryan, Ayushmann Khurrana, Vicky Kaushal and Diljit Dosanjh.